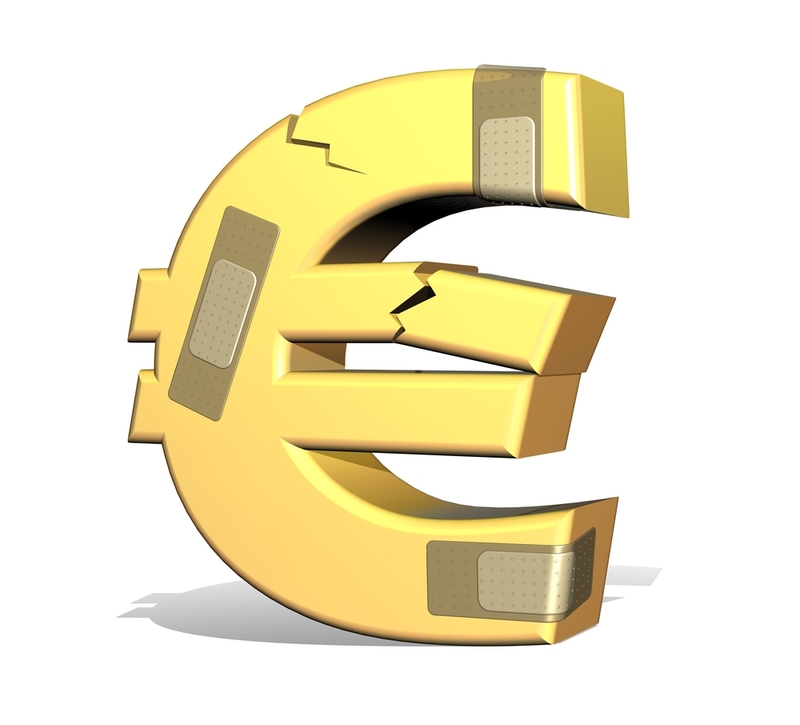 Will EURO Finally Crack 1.10 on ECB? For the past 24 hours EUR/USD has been flirting with 1.10. The currency pair traded above and below this key level but so far there hasn’t been a meaningful break. Traders are clearly waiting for Thursday’s European Central Bank meeting and are divided on how aggressive the ECB will be. The sell-off in the euro ahead of monetary policy meeting tells us that some traders are hoping for immediate action in the form of support for Italian banks or an extension of the end date for bond purchases but we feel that the chance of a short squeeze in EUR/USD post ECB is stronger than a steep sell-off. First, speculators are very short euros according to the CFTC’s latest report and this explains why the move to 1.10 has been slow. 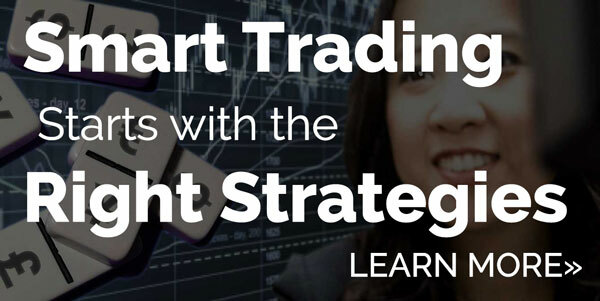 Secondly, the ECB just eased in March and began their Targeted LTRO program on June 22nd. Throughout this period, they have said they need more time to assess the full impact of stimulus and we expect this view to remain true in July. Had financial conditions tightened post Brexit the ECB would feel greater urgency to act but the German DAX is close to recovering all of its Brexit losses and the VIX which measures volatility in stocks dropped to its lowest level since 2014. The weakness of the euro provides automatic stimulus to the economy, which means the ECB can afford to wait. So the potential for an initial short squeeze is high if the central bank stands pat and the outlook thereafter will depend on how strong of a message the ECB sends. Traders will compare Draghi’s guidance with that of the ECB and BoJ who are expected to move next month. 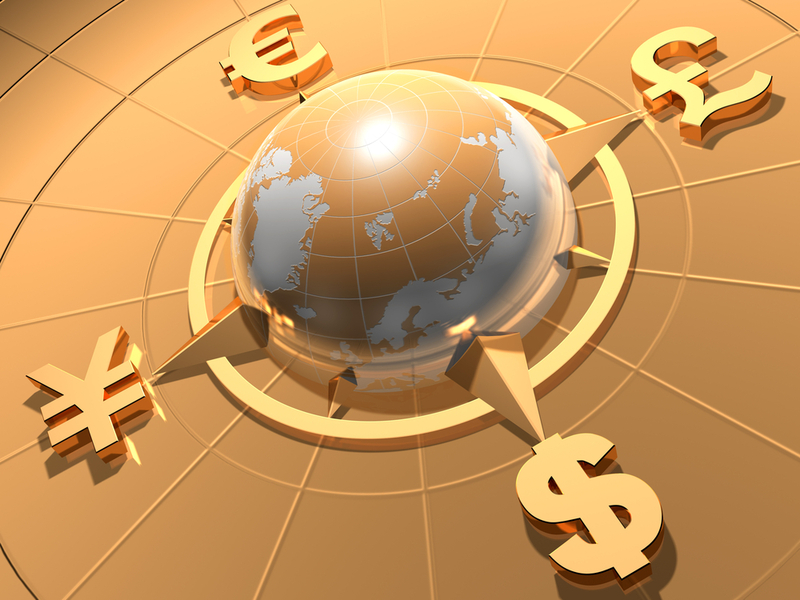 If he comes up short, EUR/GBP and EUR/JPY could end the day much higher. Of course, if they ease tomorrow in any shape or form, EUR/USD will make a run for 1.09, dragging all euro crosses down with it. 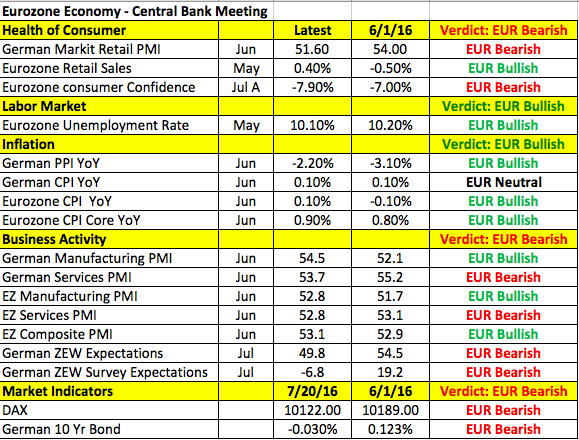 The following table takes a look at how the Eurozone economy changed since June. Bear in mind, most of these numbers reflect the performance of the economy pre-Brexit and there are a few key releases missing such as the German IFO, German retail sales and employment figures. Nonetheless, it is clear that the economy was not uniformly weak. Consumer spending was steady, labor market conditions improved, consumer prices moved higher and manufacturing activity accelerated. However more “recent” indicators such as Markit Retail PMI and Eurozone Consumer Confidence reflect the initial effects of Brexit and the banking crisis in Italy are valid reasons for the central bank to remain nervous. 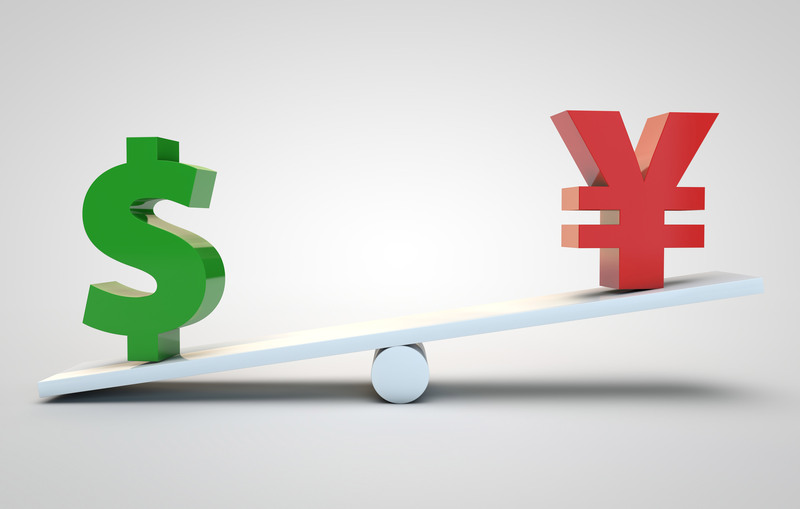 The bottom line is we expect no changes from the ECB tomorrow and even if Mario Draghi is dovish, leaving the door open to additional easing, if no immediate action is taken, euro could trade higher with the recent low setting a bottom. The best performing currency today was sterling, which traded sharply higher against all of the major currencies on the back of stronger employment numbers. Jobless claims rose only 400 but the May numbers were revised higher and the 3 month employment change rose 176K, the most this year (economists were only looking for a 73K rise). Most importantly, average hourly earnings rose 2.3% up from 2%. Investors latched on to all these figures and drove GBP/USD upwards but excluding bonuses, weekly earnings growth actually slowed to 2.2% from 2.3% and the unemployment rate slipped to 4.9%, the lowest level in more than a decade. 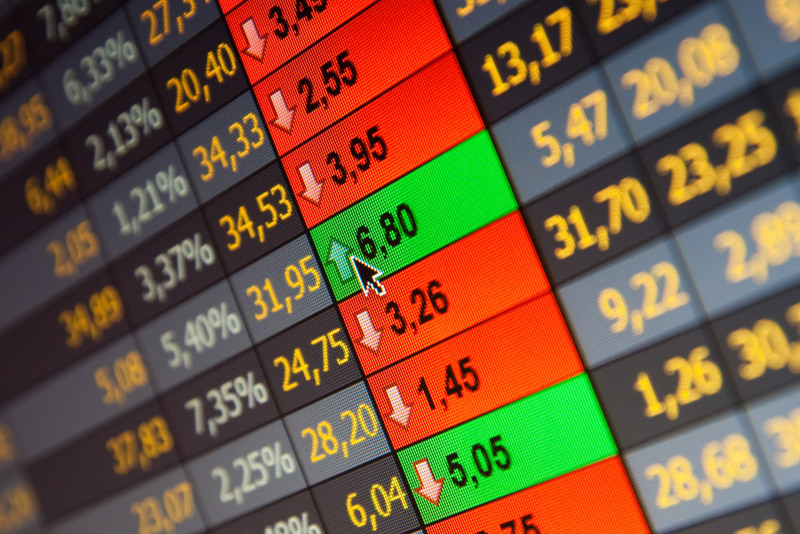 Retail sales are scheduled for release tomorrow and investors are looking for a steep decline that could ease some of today’s gains. Ultimately all of these reports don’t fully reflect the impact of Brexit and are therefore unlikely to alter the central bank’s bias to ease. The New Zealand dollar dropped more than 1% after the Reserve Bank made it very clear that they plan to ease monetary policy in August. In their one-off economic update the RBNZ said it is “likely that further policy easing will be required” because the strong currency is driving inflation lower and holding down tradable goods. They also see many uncertainties around the outlook with the currency in particular making it difficult to achieve their inflation goals so “a decline in the exchange rate is needed.” In response to these comments, economists have rushed to lower their rate forecasts with some now calling for easing in August AND November. Meanwhile both the Australian and Canadian Dollar lost ground to the greenback today despite the rise in U.S. stocks. Gold fell over 1%, dragging AUD down with it. 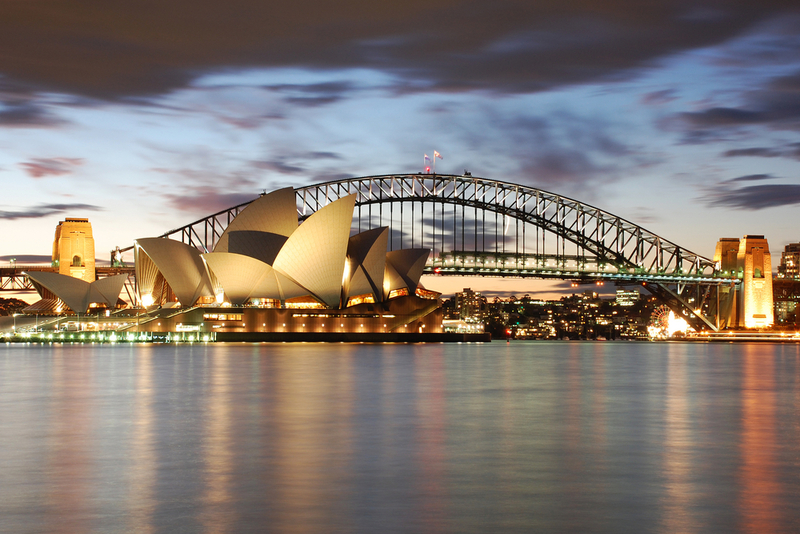 AUD/USD sunk below the 0.75 level and the downslide is likely to continue after this week’s dovish RBA minutes. USD/CAD on the other hand traded higher on the back of a rising dollar. Crude Oil Inventories came in at -2342k, well below the -2000k figure that was expected. Oil prices rebounded in response but the impact on CAD was limited. There is no data on tap for Canada or Australia in the upcoming 24 hours. Lastly U.S. stocks climbed to record highs while Treasury yields increased today, driving the U.S. dollar higher against all of the major currencies with the exception of the British pound. No U.S. economic reports were released but risk appetite continues to be bolstered by the hope of dovish comments from the ECB and the prospect of BoE/BoJ stimulus next month. Jobless claims, the Philadelphia Fed index, existing home sales and leading indicators are due tomorrow but all of these reports will take a back seat to ECB and its impact on risk appetite.